*Sometimes it’s better to just leave the past in the past. Or else you’ll face the wrath of Fredro Starr. Power 105.1’s Charlamagne tha God found out firsthand what happens when you bring up a topic the rapper/actor doesn’t want to revisit. The topic in question: a comment Starr made in which he claimed to have received oral favors from Brandy. Charlamagne brought up the topic when the Onyx member appeared on The Breakfast Club on Thursday. “Fredro was getting head from Brandy,” Charlamagne added. From there it was on as a clearly uncomfortable Starr tried to shift the conversation in another direction, despite being the one who put the information out there in the first place years ago. “Why we got a issue, me and you?” Charlamagne asked. “You talking about the Brandy thing?” Charlamagne asked. The argument between Charlamgane and Starr continued for a few minutes longer until DJ Envy resumed efforts to steer the conversation in a different direction. Turns out it was too little, too late. Starr was fully turned up. 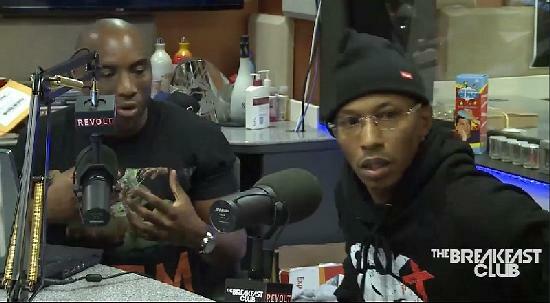 To see Fredro Starr’s full interview with The Breakfast Club, check out the video below. Charlamagne’s comments on Brandy come around the 5:30 mark, while Starr’s exchange with the DJ starts around the 8:18 mark. WARNING! Language is NSFW. Previous ArticleDid You Know These Six Celebrities Have Buried A Child? Fredro should’ve known Charlamagne is a gossip queen clone of Wendy Williams that feeds off controversy & constantly stirs the pot to boost the Breakfast Club ratings. Dude got caught slippin in the line of fire without his bulletproof vest.